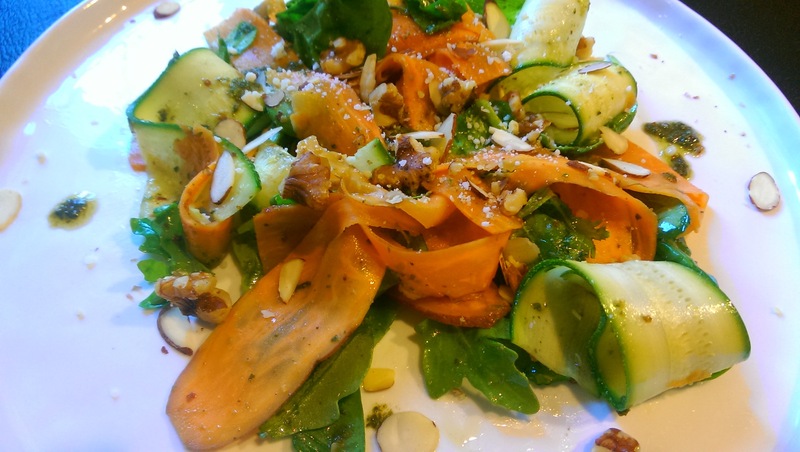 Who needs real pasta when there are so many veggieful imposters out there: sweet potato, zucchini, rutabaga, yellow squash and so much more. I love the real slim shady – that fiberless, refined, calorically dense carbohydrate that loves to wreak havoc on my body, but as I always say,if I am going to eat it I want it to be the best. So I’ll wait until I have an opportunity to consume the perfect handmade al dente pasta which is few and far between. In the meantime I would rather an impasta. I usually use a spiralizer to make noddles, but lately I have been craving a flater wider noodle – like pappardelle or even fettuccine would do. On a recent trip through an airport, I saw a beautiful picture on the cover of Food & Wine Magazine of pappadelle with pesto, arugula and walnuts and wanted to make it my way. 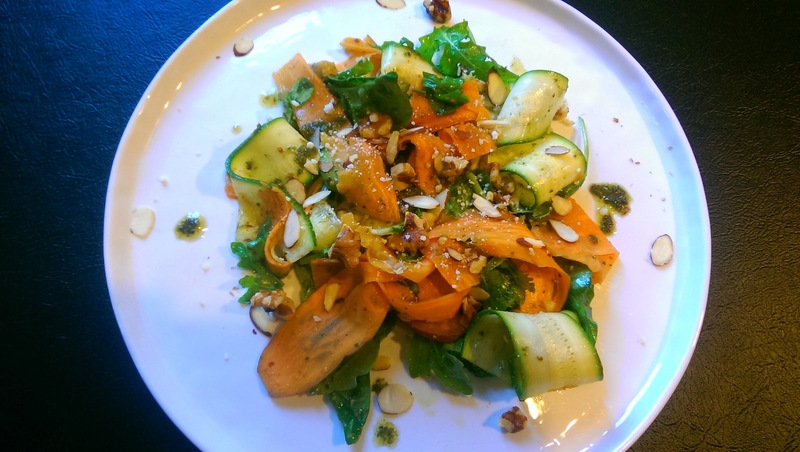 Sweet potato noodles with zucchini, baby spinach, arugula, almond slices and walnuts and topped with a power pesto made of leafy greens, basil and nuts and a cashew nut based parmesan. Not as pretty as the front cover, but very very tasty. The sweet potato noodles were inspired by a Top Chef episode many moons ago when Richard Blais made fettuccine out of sweet potato. The key to his success in fooling the judges was using a vegetable sheeter which has a rolling technique to slice veg into thin continuous pieces that are long ribbons (similar to making real pasta) that can be trimmed to the appropriate size. These tools are ridiculously expensive and unless you plan on making impasta in high volume, not necessary. So I cheated and used a standard mandolin. The downfall is you don’t end up with long sheets of “pasta” which already takes away from the illusion of being pasta and then is prone to break during the cooking process. You can use a spiralizer if you want, but sometimes spiral noodles feel out of place. Pasta exists in different shapes and sizes because it does influence flavor and cooking, so I wanted to mimic that. 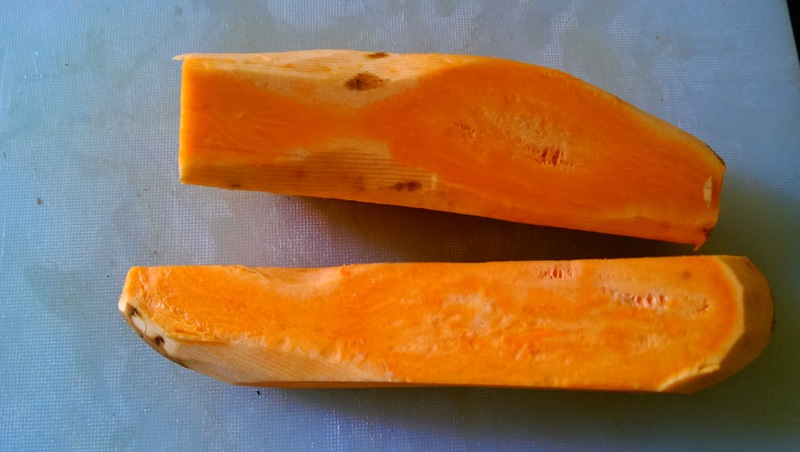 Starting with sweet potato, I trimmed it by cutting of the sides and ends to “square” it off. This allows for even size sheets of pasta. (To avoid wasting food, I used the scraps to make a stock). 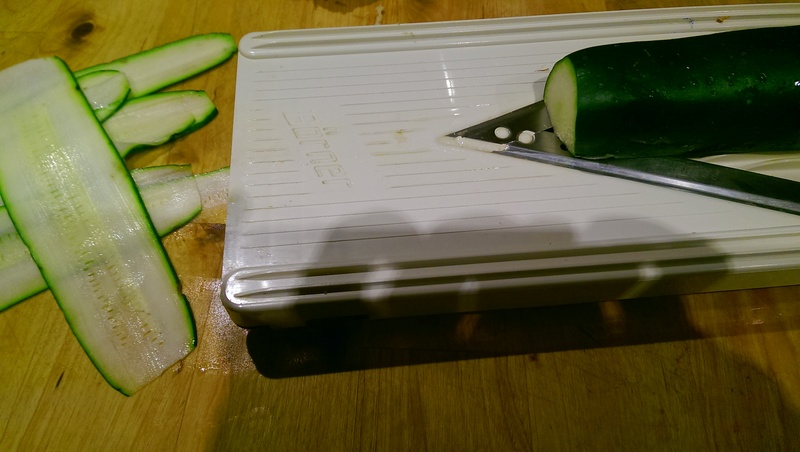 The squared off potato was sliced with a mandolin, similar to what was done with the zucchini. The impasta was cooked in salted boiling water for about 3 minutes. 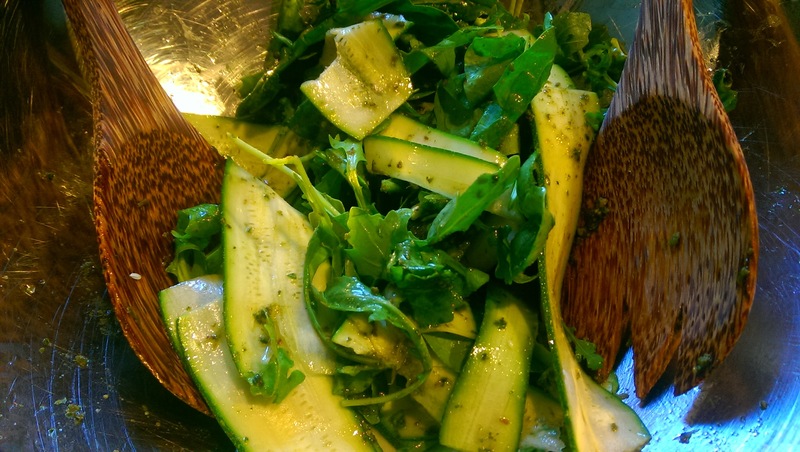 Meanwhile, add the raw mandolin sliced pieces of zucchini to arugula and baby spinach leaves as well as lemon juice. Toss them together in a large oiled bowl with some of the pesto. 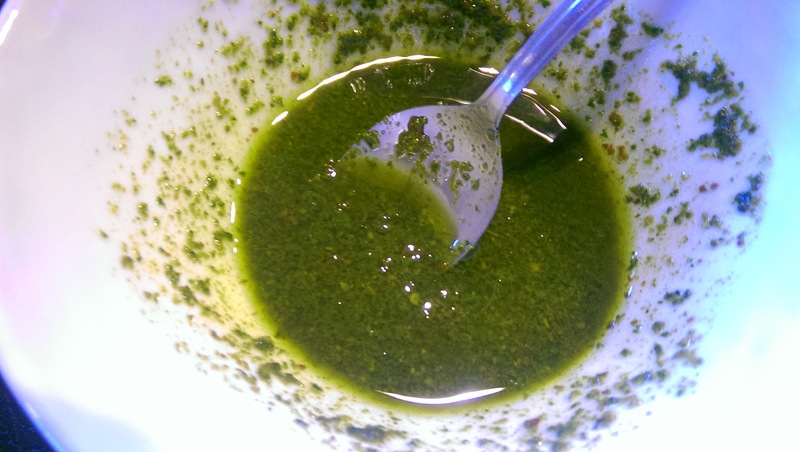 I previously posted a recipe for this power pesto – it is full of greens and nuts – rich in vitamins, protein and fat. to prevent it from breaking the noodles, I mixed in extra olive oil to make it more liquidy and drizzled and better incorporated on this gently pasta. 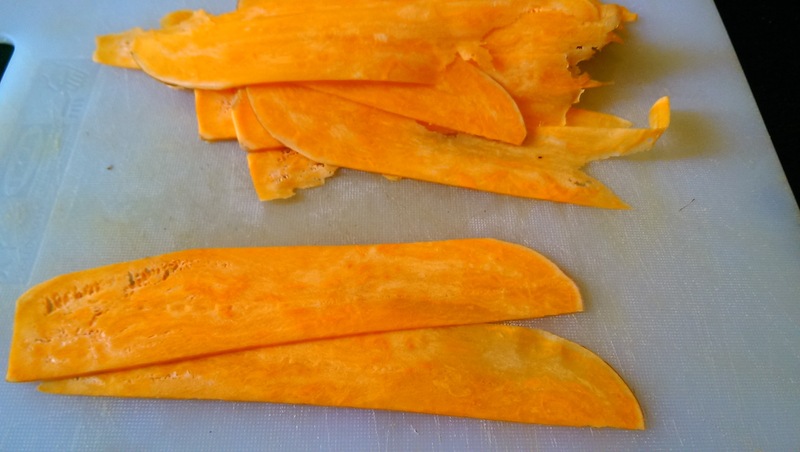 Drain the sweet potato pasta and gently toss with the mixed ingredients. The noodles may break – especially if over cooked so it is better to keep them “al dente”. Salt and pepper to taste. Place onto a plate and garnish with cashew nut parmesan (super simple to make with a food processor), toasted walnut and sliced almonds. In a small skillet, toast walnuts over a low heat until golden brown (about 1 min), cool and chop or crush into pieces. 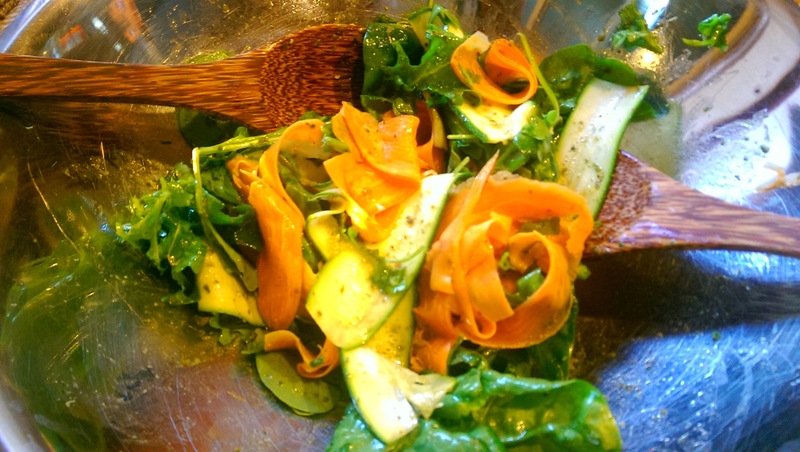 In a large wide bowl appropriate to toss ingredients, place zucchini ribbons, arugula, spinach, pesto and lemon juice, mix and set aside. 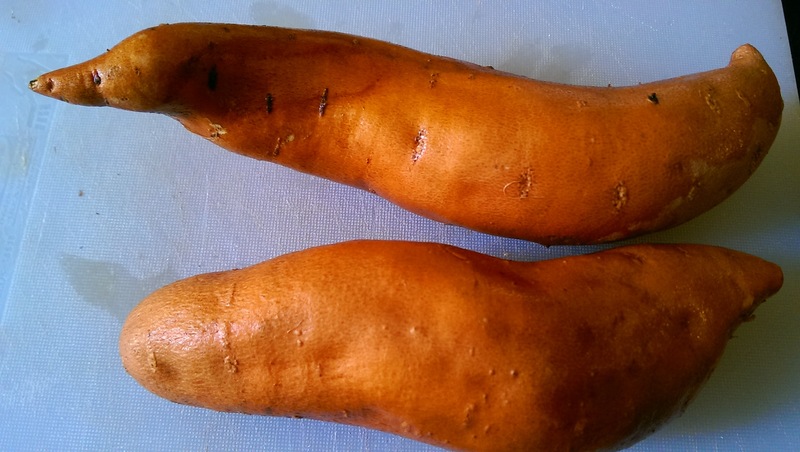 In a pot of boiling salted water, cook sweet potato noodles for 1 minute, drain and place gently in bowl gently toss with veg. Add salt and pepper to taste. 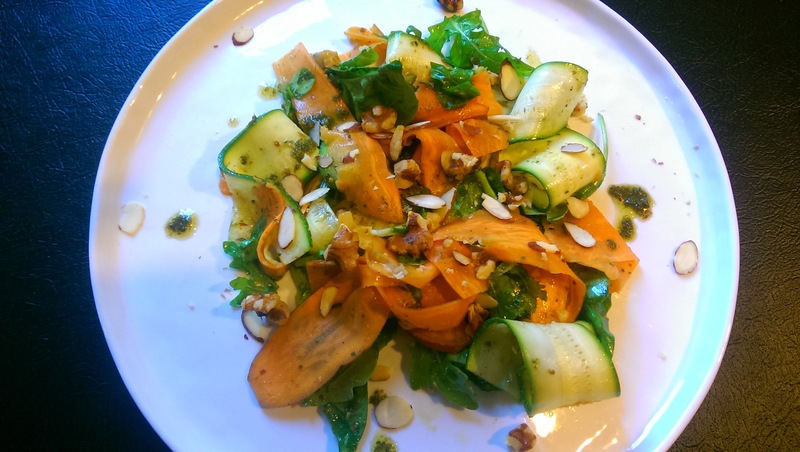 Serve garnished with cashew nut parm, almonds and walnuts, drizzled with pesto as needed. Place the nuts into a food processor and blend until they are a coarsely ground. Add 1/2 cup of olive oil and continued to process until incorporated and pasty. Add in garlic, kale, beet green, basil and lemon juice and continue to blend. Add oil slowly while blending until reach desired consistency. Add salt to taste. The pesto is thick. Scoop out about 1/8 of a cup and mix it with olive oil so it is thinner and can be drizzled over the pasta. Add all ingredients to a food processor and process until a smooth powder has formed. Store in the fridge in an air-tight container.